SVG Cutting Files April Challenge is on it's way!! Create a Summer Themed Card using a file from SVG Cutting Files as your main focus. at our Facebook Group's Summer Card Challenge Album, HERE. 3. Winner will receive a $10 gift certificate to SVG Cutting Files. 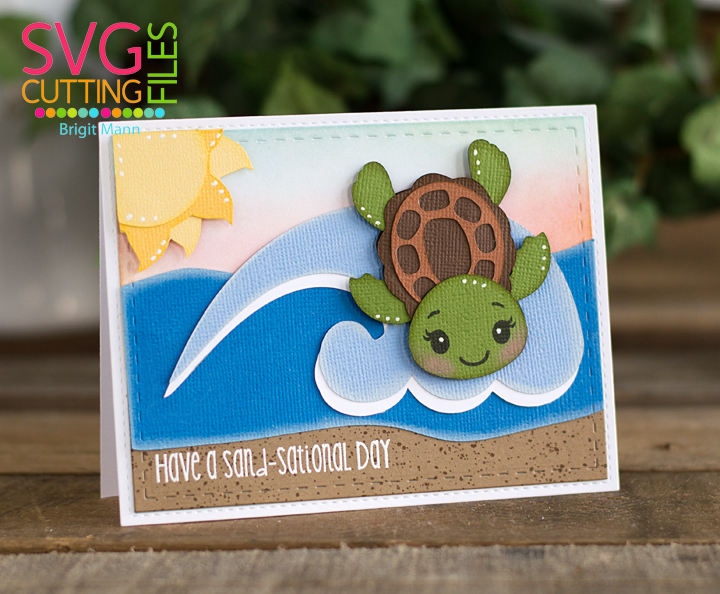 I made a card using the cute little turtle from the Sea Life set coming off a big wave to wish you a sand-sational day!! The sun is one of the Kawaii Sunshines and the sentiment and card mat are from Jaded Blossom. I just love your sweet turtle. This is stunning! Love every element and especially how you shaded the background! Never would have thought of using different colors instead of just blue but the effect is gorgeous! such a pretty card !!! love the whole scene !